Travis Perkins plc has been named as an official partner of the event, along with a number of other major brands. 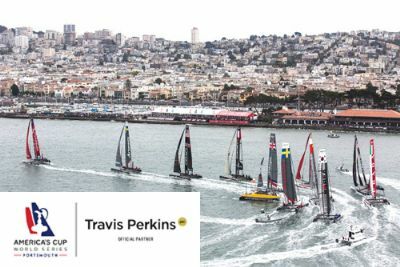 Organisers of the Louis Vuitton America's Cup World Series Portsmouth - the first event of the prestigious 35th America's Cup - has announced that Travis Perkins plc, Coors Light, BT Sport and the 1851 Trust are the official partners of the event. "The project will enable up to 1,000 young people from diverse backgrounds to take part in amazing sailing experiences. The program is designed to inspire, build confidence and develop new skills and complements our 'building better, together' ethos perfectly." BT Sport will be the exclusive UK Live Host Broadcaster for the 2015-2017 Louis Vuitton America's Cup. At the 2015 Portsmouth event it will be offering live coverage of the opening races on July 25-26 to viewers in the UK and Republic of Ireland, and will continue to show all live races, through to the America's Cup finals in 2017. The 1851 Trust is the Official Charity of the Portsmouth event. It aims to motivate and engage a new generation through sailing and the marine industry, providing young people with the education, skills and training to become innovators of the future, and stewards of the marine environment.